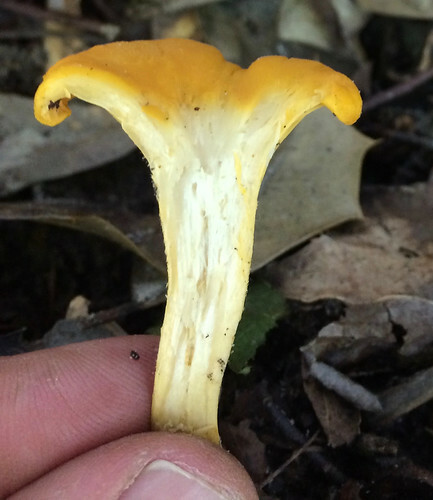 Note how the gills run down into the stem. 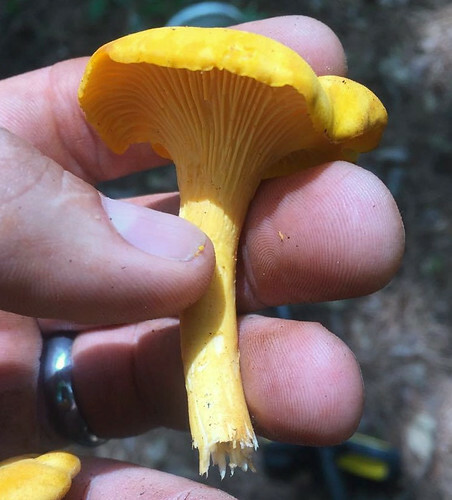 Cross-section showing the false gills. There is no demarcation between the cap and the "gill" structures, they are all one continuous unit. 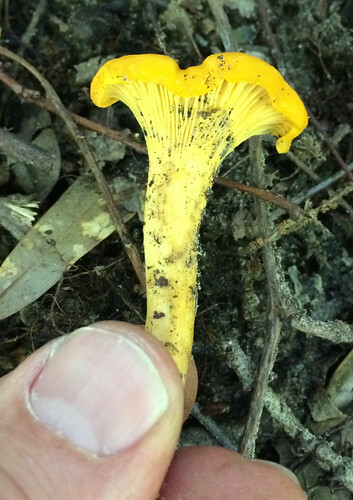 Cantharellus lateritius false gills aren't as produced as those of other chanterelles. 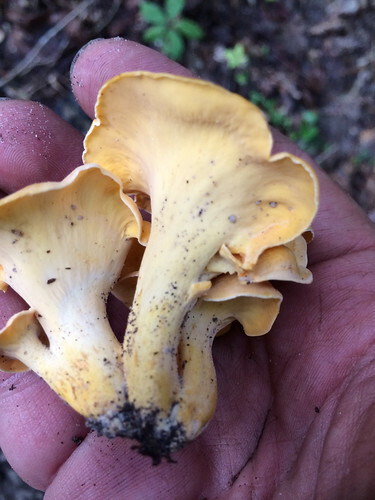 Walking through the Texas hard wood forests after several days of summer rain, a forager's eye will invariably spot gold and bright red mushrooms growing up from the forest floor, especially along ravines and washes. 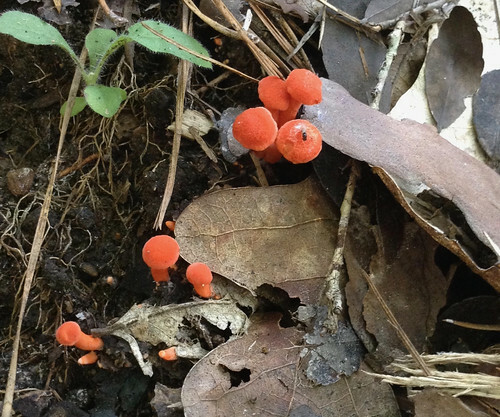 Most commonly, they will be near oak trees as these fungi treasures have developed a symbiotic relationship trading needed chemicals with the oak roots. They seem to like daytime temperatures between 80F and 100F. I personally use Mother's Day as the signal to start looking and September 1st as the end date. 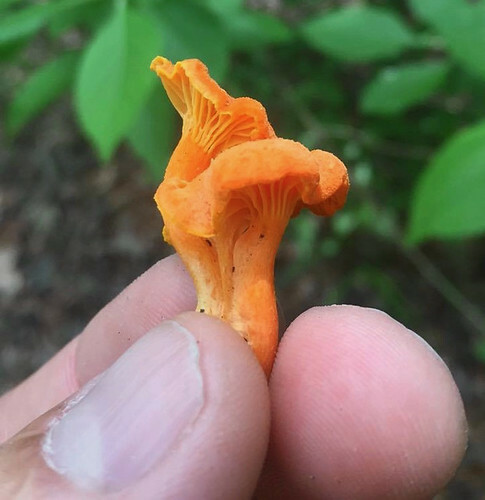 There are several key physical traits you need to look for on chanterelles to properly identify these awesome, edible mushrooms. 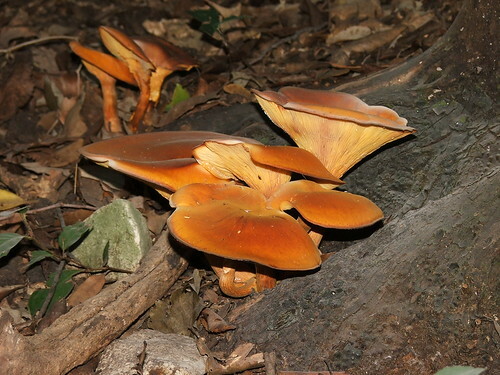 That they grow out of the ground in hardwood forests has already been stated. They do NOT grow on living or dead wood. 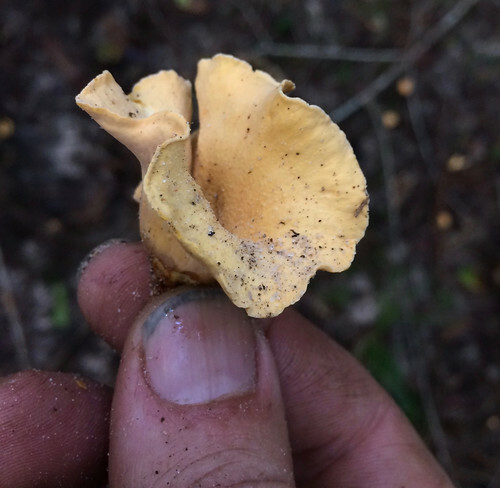 All chanterelles have false gills, meaning their cap and gill structures are one continuous unit. They don't have gills but rather the underside of the cap is very wrinkled to the point of looking like gills. When cut in half it is easy to see there's no change in between the cap and the false gill material. 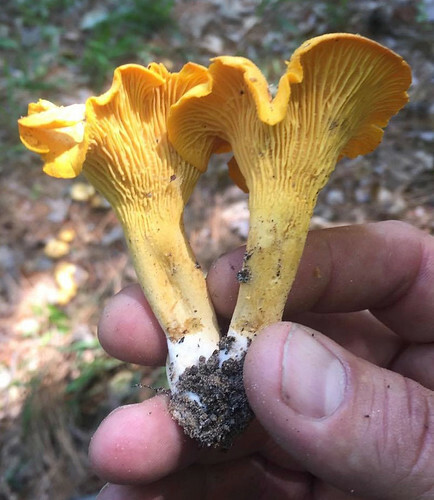 These false gills will run down and merge into the stem, a term described as "decurrent". 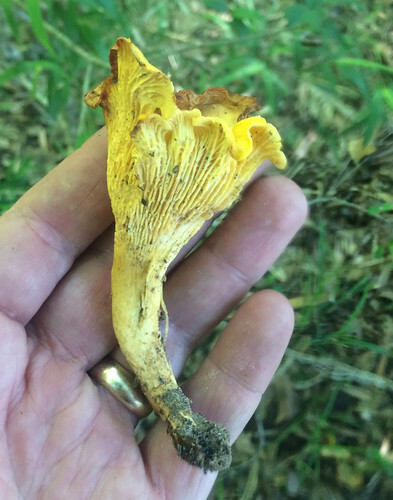 The stem lacks any ring or bulb at it's base. 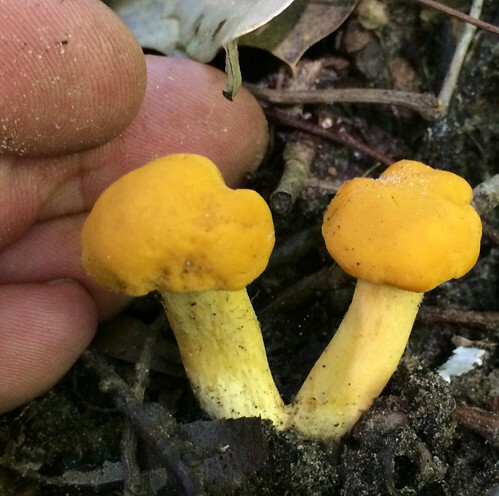 Several mushrooms may be joined together at the base of their stems. 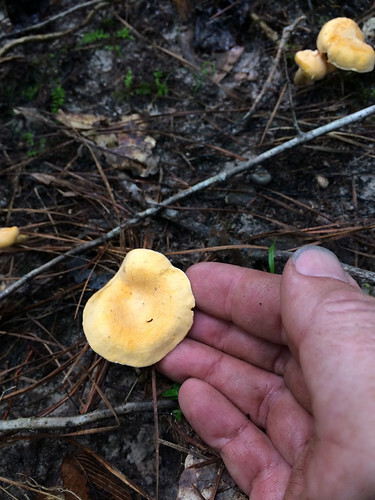 The caps are shaped like an upside down bowl when very young but soon invert into a funnel (convex) shape. Spore prints will be light gray/white in color. 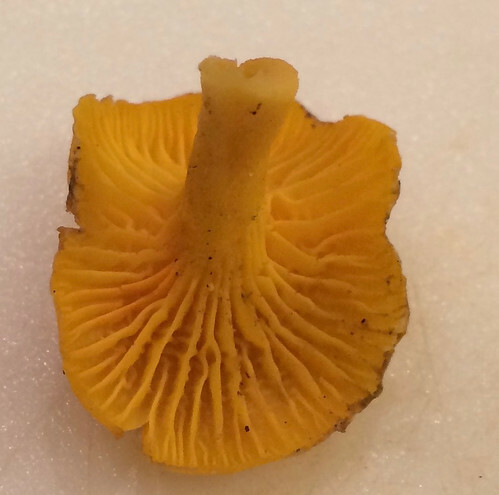 Chanterelles sauteer in butter with a bit of garlic and a splash of homemade wine is very hard to beat. 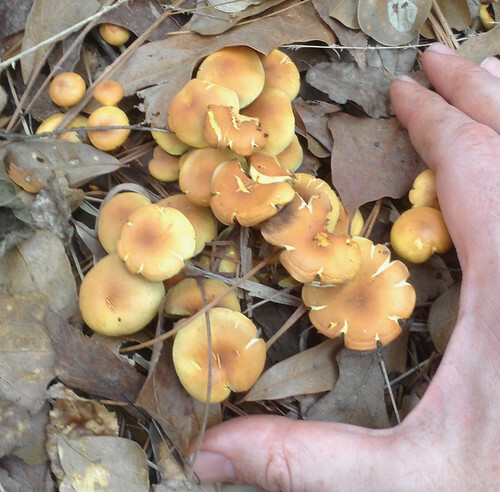 These mushrooms can be used in all the "normal" ways that mushrooms are cooked. 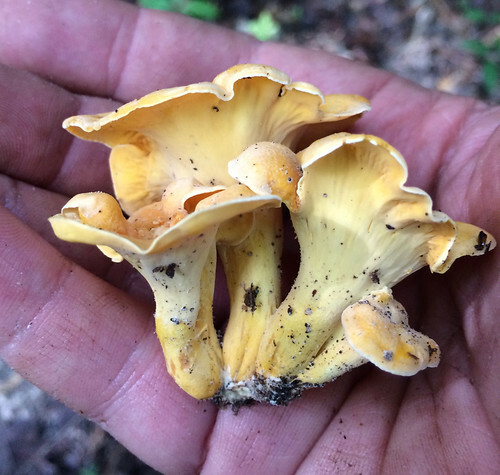 The golden chanterelles has a mild, almost fruity flavor while the red cinnabarinus have a spicy, peppery flavor. They dry well for longterm storage and are usually rehydrated in hot water before use. 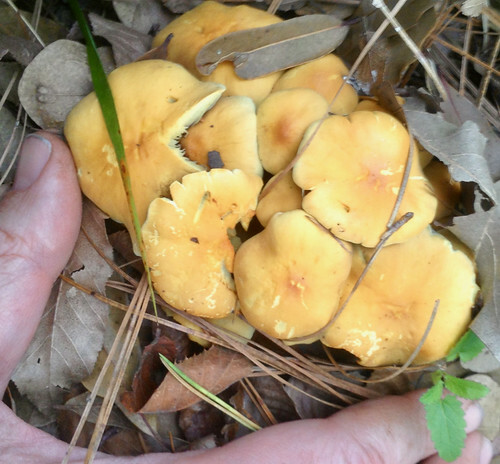 There are two poisonous mushrooms in my opinion that a novice might mistake for chanterelles. 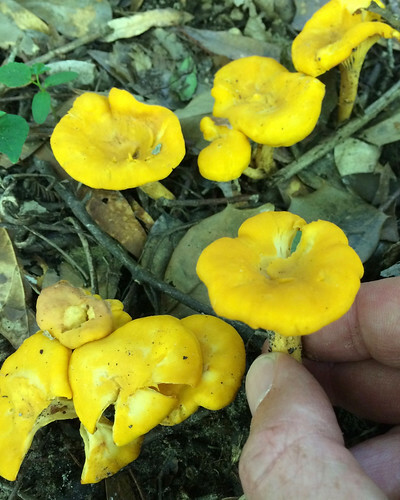 These poisonous mushrooms are Sulfur Tufts (Hypholoma fasciculare) and Jack O'Lanterns (Omphalotus illudens). 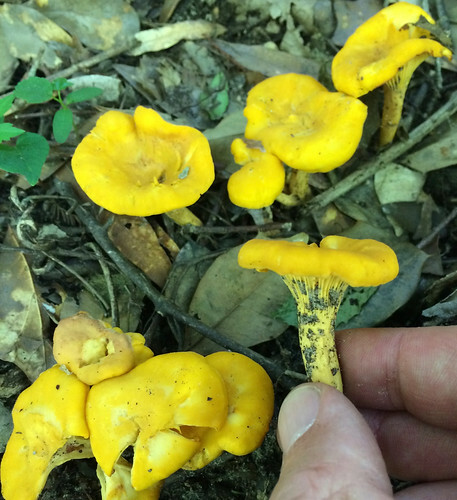 Let's look at those, starting with the Sulfur Tuft mushroom. 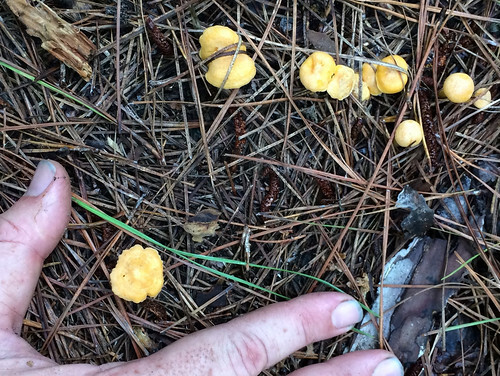 Sulfur Tufts (POISONOUS!) going off buried pine root. 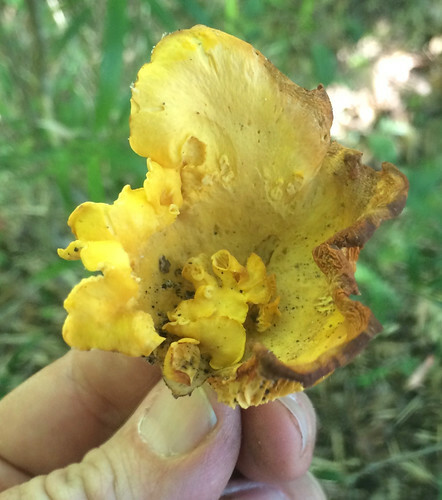 Unlike chanterelles, sulfur tufts grow on the dead wood of pines. 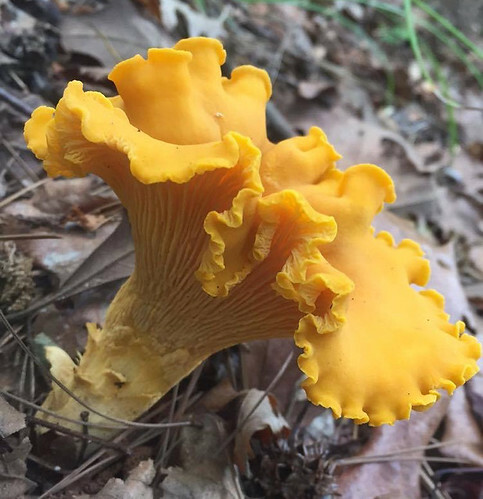 Their caps will look similar to chanterelle but sulfur tufts have true gills and these gills may start yellowish but turn greenish then darken greatly as spore production gets heavy. 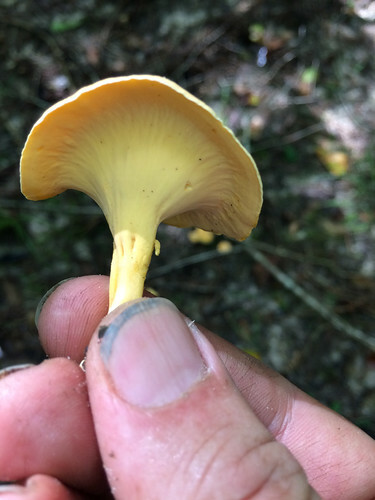 The gills come to a sharp stop at the stem. Spore prints will be purple-brown. 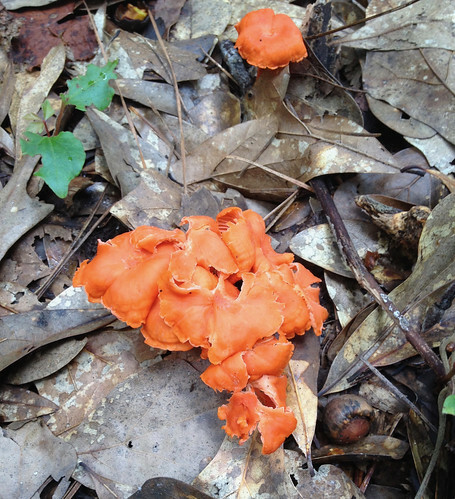 Like the sulfur tufts and again unlike chanterelles, Jack O'lanterns grow on dead/dying hardwood. 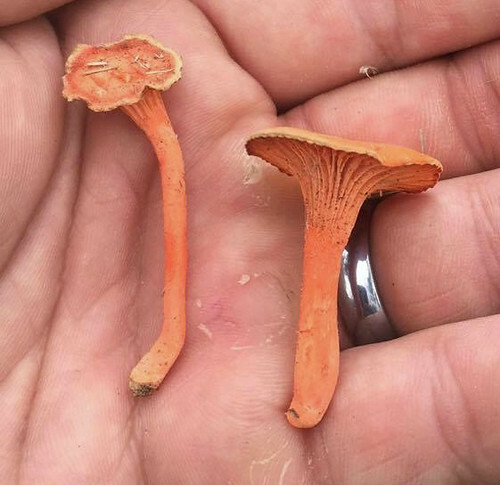 They are dark orange in color, and have true gills which end at the stem. 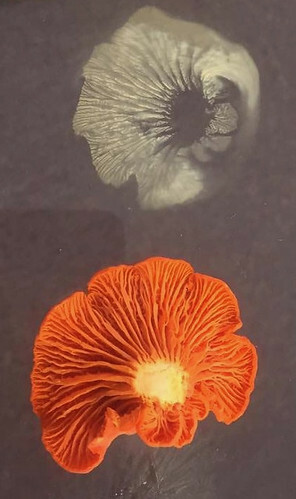 Jack o'lantern spore prints will be pale, creamy, or yellowish.